Launcelot was kidnapped at the age of 12 or 14, from his mother (his father being dead) in the "west country" of England, and brought as a cabin boy on shipboard to Plymouth Plantation. There he was appenticed for two years to pay for his passage. [According to James N Granger as reported to him by Sarah Granger Harmon (1731-1830)]. 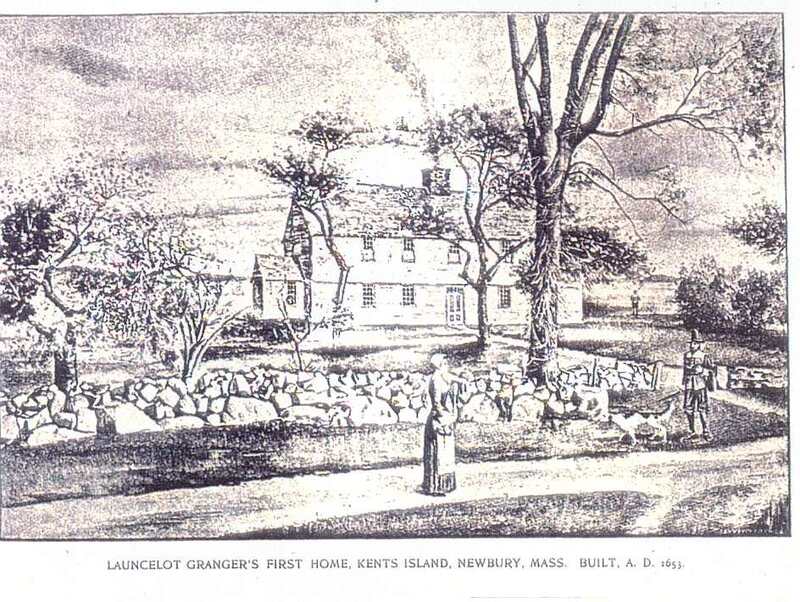 Launcelot's First Home at Kent's Island, Newbury MA was built in 1651. He moved there with his wife in 1653/54. It stood until 1888. Kent's Island is a rocky island of about 200 acres. Launcelot and his family moved to High St in Suffield CT after Jun 12, 1678 when the inhabitants of the town returned followed King Phillip's War which had disrupted the settlers. His lot was the 33rd granted according to town records. The lot was between the lots of George Granger to the north and Thomas Granger to the south extending from High St west to Muddy Creek to the west. Suffield Site Map showing adjoining Granger lots along the center of High St. Daughter Dorothy married Robert Old, emigrant and an original settler of Suffield MA whose granddaughter Elizabeth married Daniel Granger, grandson of Launcelot. 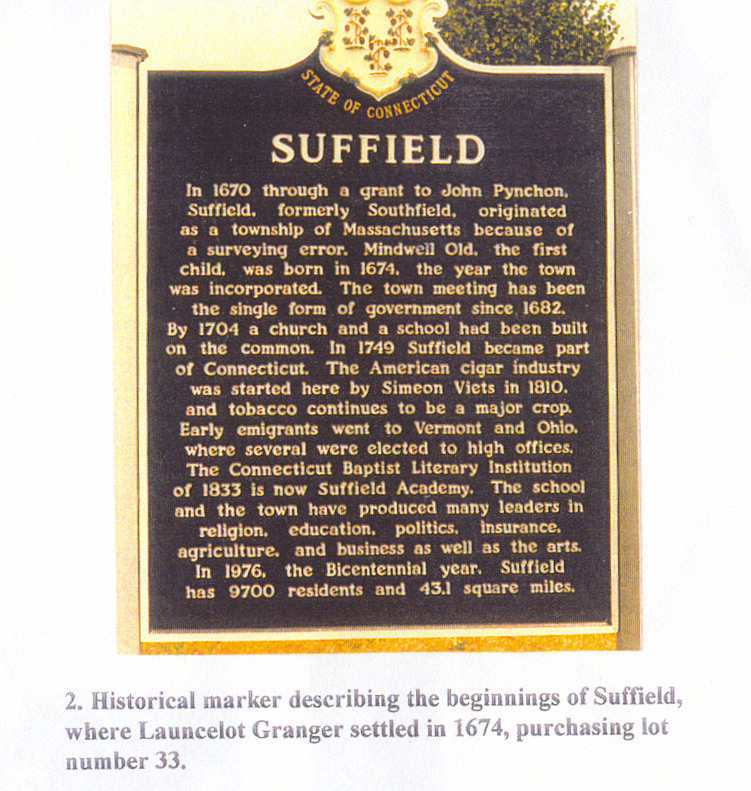 Suffield Historical Marker, describing the beginnings of Suffield. Photo taken in June 1980 of the reverse of the marker taken in June 1980. 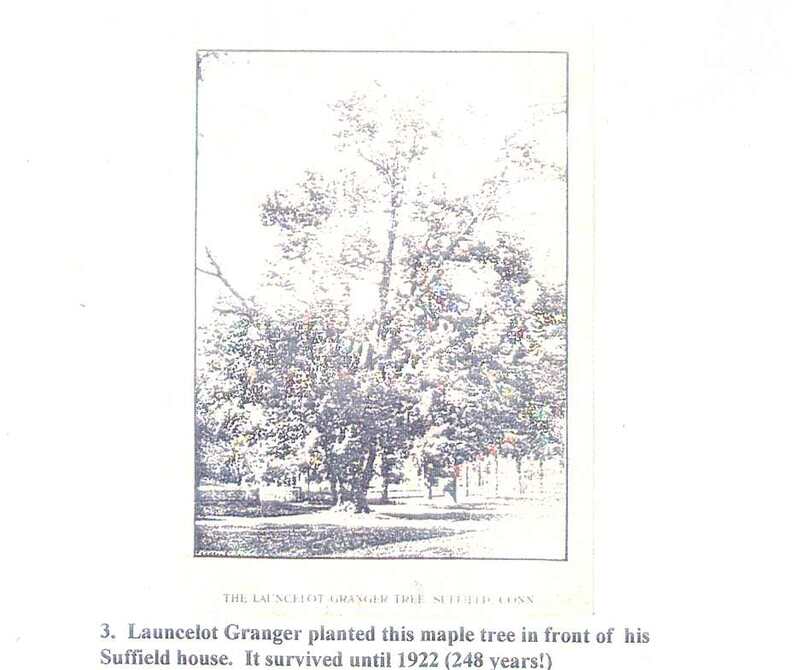 Launcelot Granger Maple Tree was planted by him and survived until 1922 (248 years). 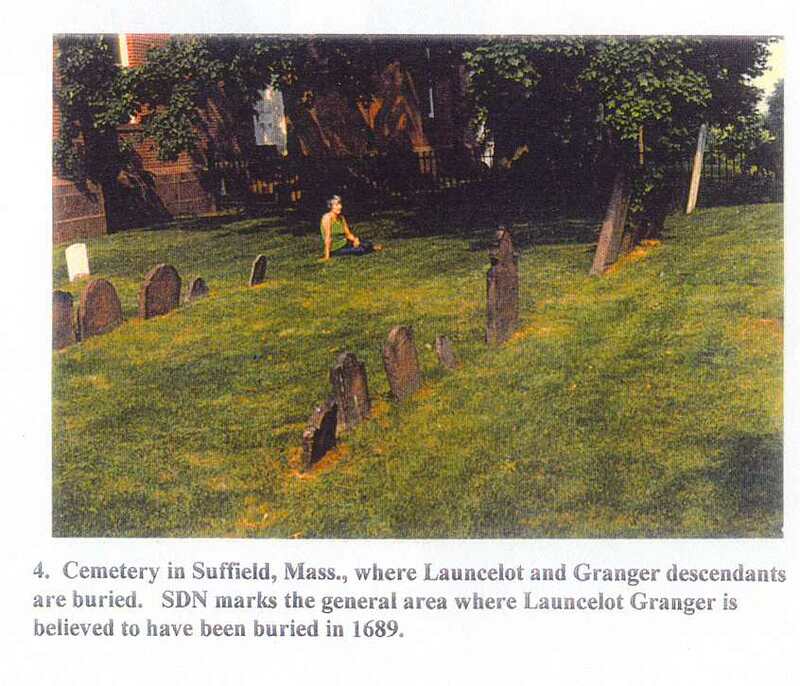 Suffield Cemetery where Launcelot and Granger descendants are buried. His descendant, Sylvia Novak, shows the area where Launcelot was believed to be buried. Alcorn, Robert Hayden, The Biography of a Town: Suffield Connecticut, 1670-1970, Suffield, 1970, p. 14. Granger, James N., Launcelot Granger of Newbury, Mass. and Suffield, Conn.: A Genealogical History, 1895. Granger, James N., "Suffield", Chapter 7 of Granger Genealogy, photocopied from the book, Niagara Falls, 1893, pp. 45-48. Van der Poel, Peter G., "Notes on the Origin of Launcelot Granger", The American Genealogist, 29(4): 245-251, Oct. 1953.